The first magic stone was a gift from Kaedon to Kala; the Unicorns of Kalidore celebrate the event by donning stones of their own. These magical stones grant the foals something special – such as a beautiful and unique colour. While it-s certainly not necessary to have a breeding item to produce an awesome foal, stones can certainly work to enhance what your foal naturally has! There are a few things to remember about stones. (passed on) to each subsequent generation. Wind Stones – can be used by all mares. These offer a unique boon to the expectant mare – such as twins, a chance to predict the foal’s colours, or even a male offspring. Earth Stones – can be used by all mares. These only change the foal’s appearance and cannot be passed on to the next generation. Stones are further organized into four distinct subtypes, based on what they do. You can use more then one stone per breeding, so long as they are of different subtype & group. Muse Type ~ works with the foal’s base coat colour to obscure/create a new colour. The Imperial Blue and Silverfade are Muse Stones. Maze Type ~ produce certain patterns/overlays on foal of all colour. Brindle and Starburst are examples of Maze Stones. Myst Type ~ completely covers/overrides all base colours & patterns to create something new. The Celestial and Moonstone are examples of Myst Stones. Marvel Type~ these work differently all together. The Passion’s Flame and Sunstone are both Marvel Stones. Most Windstones and many of the rarer Star Stones are Marvel Stones too. Each breeding stone may only be used once. Imperial Blue – changes the base colour to blue works with existing coat patterns; thus the effect can be very light or very dark depending on the original coat colour. Mottle – creates a “cat spots” effect on the base colour; spot patterns range from a wide variety of mammals; reptilian and other pattern mimicry is rare. May override existing natural patterns. Brindle – creates a varied brindle effects on the coat colour; there is also a rare chance of other striping patterns such as zebra, tiger or okapi. May override existing natural patterns. Moonstone – creates a stunning a subtle rainbow opal effect. Will override natural colours. Jade – creates a beautiful, variegated natural stone effect. Green is the common colour, but a rare chance of other Jade hues exists. Twinning Stone – blesses your mare with twins. Twins are always female unless a Sunstone is used. Foundation Mares have a small chance of mixed gender twins. Sunstone – promises a male offspring. Unless this stone is used, all offspring are born female. Pebble of Youth – keeps your kore forever-young! You may choose to lock your kore in at either the foal or weanling stage. Probability Stone – a chance at predicting your foal’s very outcome. Provides a chance to choose pose, colour, even choose rare patterns & variations. Kal’s Blessing – allows any visible effects on the mother to pass to the offspring regardless of type. 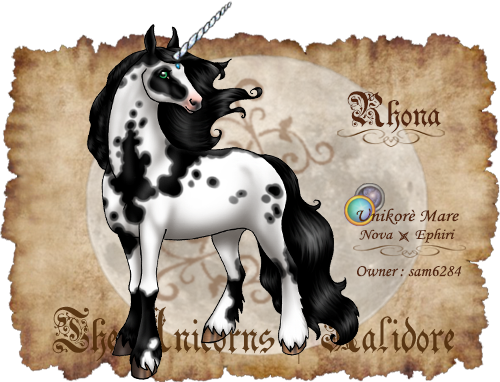 allows a non-Foundation Stallion the opportunity to breed; Consent Stone is open to all breeds; while the Courtesy Stone only works on standard-type unicorn. Mesostone – produces a Messopippen, the smallest breed on the isle.There is a 1/3 chance of breeding true in a regular meso + foundation pairing. Guardstone – produces a Toreregarde, the largest breed on the isle. Tores are also the rarest unicorn type.There is a 1/5 chance of breeding true in a regular tore + foundation pairing. Flightstone – produces an Aviquinn, the winged horses of the Isle.There is a 1/4 chance of breeding true in a regular avi + foundation pairing. Note: The possibility of hybrid species (ie – Alicorns, Mesotore & Avipippens) is very rare, as only 1/10 breedings will be successful. In summary: all stones form each group can be combined with stones from another group to provide wonderful variations of coat! The exceptions are Earth Myst Stones, which tend to override just about everything, and the Gypsy Star Stone, which combines with anything, including other Maze type stones. While unique Kismets can be designed for custom orders, these types are not available during regular breeding season. Other stone properties will be added as they are discovered, so check here for new announcements!